I wanted to title this “Lamest Craft Ever” but would you have clicked to read that? You would?! If so, you are totally in the right place. I have never done a craft post because just like with dinner, if I need a craft I google whatever supplies I see laying around and pick from what comes up. I also don’t know how to make crafts funny. Without booze I mean, and not only are these KID crafts, but if I can’t hit that *fun*buzzed* window while crafting before Liquor Mortis (zzZzZZzzZz) sets in: Craft FAIL. We needed some non-scary Halloween decorations, (because daycare) and I live to keep my 3 yr old busy, I mean STIMULATED, so two birds, one stone. I decided to let my 3 yr old and her 4 yr old cousin decorate their own Halloween faces. It was literally easier than bringing 4 kids age 4 and under to the Dollar Store. And cheaper. I cut out very basic shapes from colored/construction paper by tracing items from my kitchen. Pumpkins: By tracing a circular small plate. Ghosts: By tracing a large glass on one end and cutting a wavy pattern at the bottom of the other end. This SAME Arch shape, flipped over also makes Witches, and/or Frankensteins, when you decorate the face, just add warts and a triangle hat for a witch, and a Caesar haircut and bolts on the neck for good old Frankenstein. You can make them as friendly or scary looking as your children can tolerate without therapy. Know your kids. Here's what I mean. 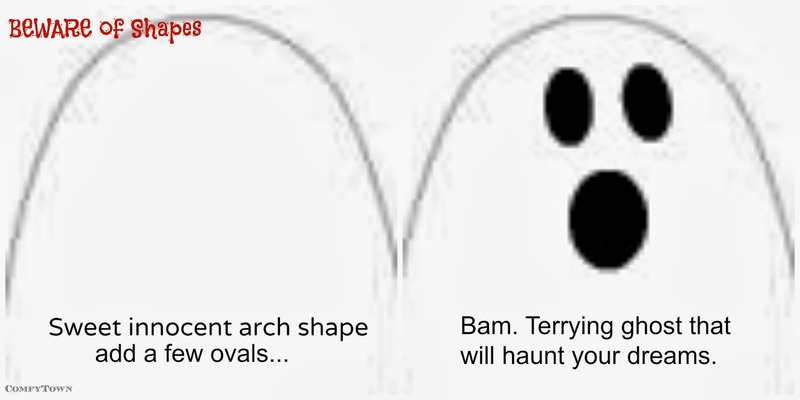 AAAHHHHH, that ghost! What is seen cannot be unseen! To decorate ours, I of course took an easy route. I just took black paper and made circles, squares, rectangles and triangles because those are easy to cut....oh and LEARNING. Using shapes is learning. Learning! 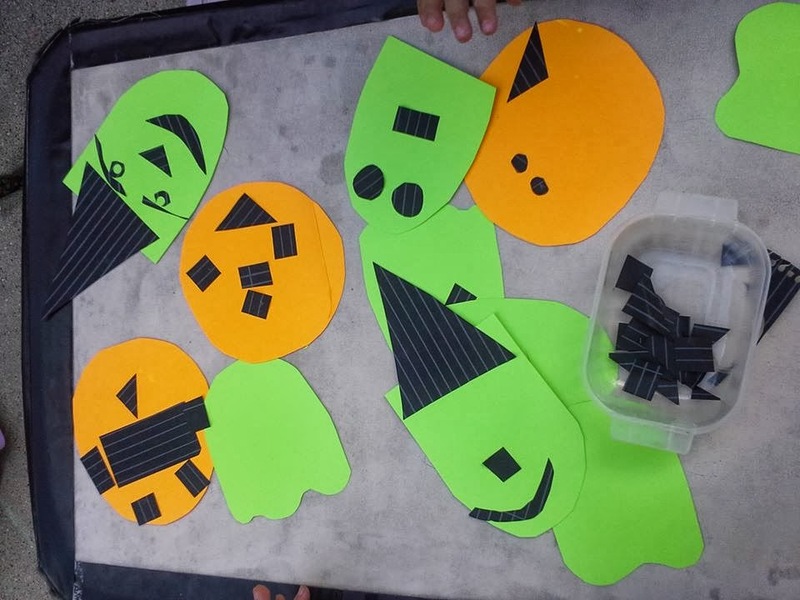 I showed the kids some jack o’lanterns and witch faces from my friend Google, and with glue sticks they made their own designs for the faces. That's it. 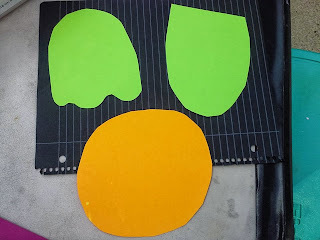 Easy faces with cut out shapes. Yeah, Geometry! The black paper I found first came from a notebook, so it had the spiral and the 3 holes along the side. I used the spiral-hole part to make pumpkin stems. Super easy and the kids loved it. Also, on the witch's face below on the far right, I cut "fancy" eyes very easily using those notebook holes. I think they audibly "Oooohhhh"ed. I know, how does she do it? Who knows. Magic. It's BitchCraft. These faces are adorable, right? Kept the kids busy, cost Zero Dollars. Forget the Dollar Store, these not-so-bad boys are all over ComfyTown's windows and no one is a-skerred. My kids don't know about Frankenstein. Yet. 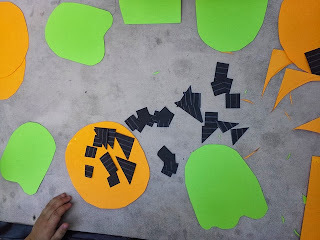 These were fast and easy, perfect for my preschoolers. 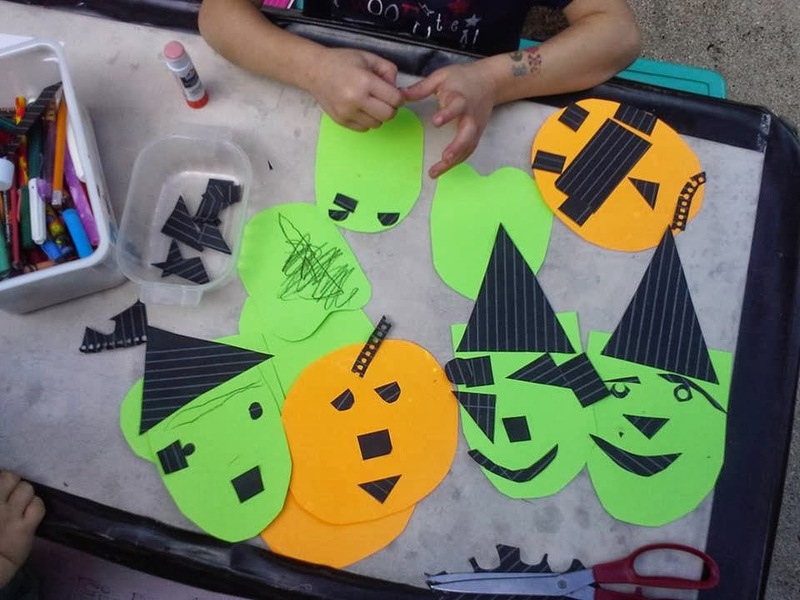 You could make them look scarier, and make the craft last longer BE MORE FUN for older kids with various items you have around your house. Use yarn for hair, or fashion some out of twisted toilet paper, or dryer lint. Look around for things like buttons you may have put aside and never actually sewed back on, or all those beer bottle caps. See I'm not a big drinker, I do it all for the CRAFTS. I also buy a lot of puzzles from resale and Goodwill, they're often missing pieces. You could paint those pieces and bam, they become Craft Supplies. Try to use the fall leaves from the yard. I envision part of the project is having them PICK UP ALL the leaves. Crafting is hard work, kids. I'm sure there are many everyday items you could use that I'm not thinking of. Any small thing like lids/packaging can be cut smaller and painted. Just remember, if you bedazzle something with glitter, and you use free-range glitter -- as opposed to easier to contain glitter glue -- be ready to take it to your grave. Glitter is the herpes of craft supplies. LOL. I totally would have clicked on the title if it said lamest craft ever, mainly to prove to you how much lamer of a crafter I am. Maybe I will file this away in the back of the old noggin for when my bambino is a bit older. Even this seems like a stretch for me, though. heh. I hear you! I can barely LOOK at the really crafty posts I see on Pinterest. Scrap-booking? Makes me want to cry at my failure before I even attempt it. The great thing about preschooler crafts is that they look even BETTER if they're not perfect. 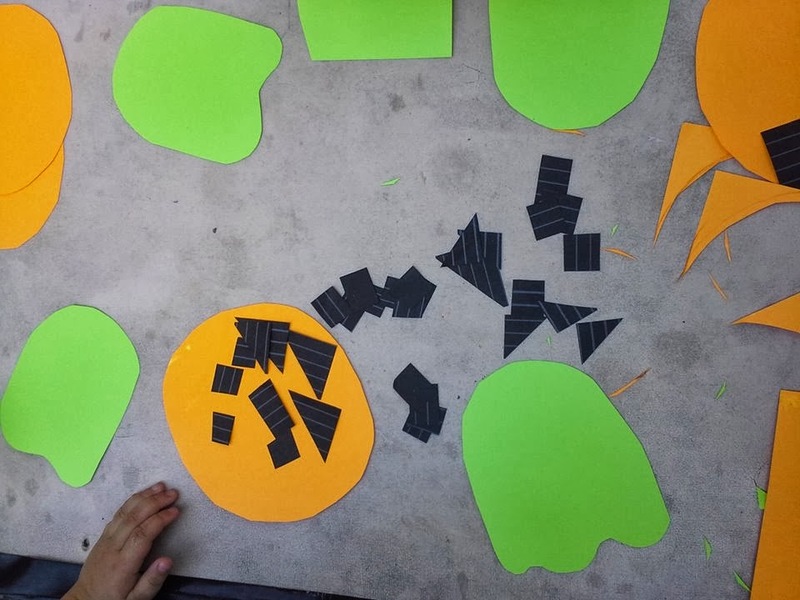 My cutting is sad-looking, but you tell someone a 3 yr old made it? ADORABLE! I'm in trouble when they're older, but eventually THEY will do all the cutting and leg work. I'll just be the Google-er and supplier of beer bottle caps. Genius! And that ghost? I LOL'ed after the ovals were added. I know, SO sCaRy. Hope you don't have nightmares. LOL! That is true about glitter. I used it with my nieces months ago and still have it showing up on my clothes and body! Suuuure it's from your nieces *wink* hahaha j/k it's scary stuff though. We only glitter GLUE. Aaaaaaaah! Your ghost scared me! This looks like a really fun craft. Makes me wish I had kids! Awesome, then YES ME TOO, you are in the right place here! "Glitter is the herpes of craft supplies." I am dying! So funny! Found you through the Super Sync Sunday hop--I'm at http://www.lovingmarshall.com if you want to visit. 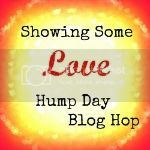 Following you on Bloglovin! Can't take credit for that one, Demetri Martin. I will check out your blog now, nice to "meet" you. Mine too! Keeps em busy, and so cute. You need to take this a step further and make reusable crafts. For example, on one side it's a ghost. Then when Christmas rolls around, flip it over and on the other side it's Santa's face (the bottom wavy line is his beard). 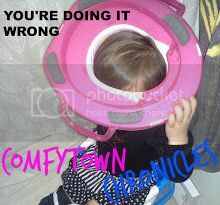 Laziness AND practicality rolled into one! 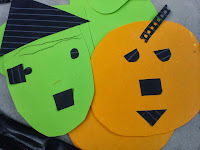 LMAO totally love this lame Halloween craft, anything to keep them busy...I mean entertained and learning! This whole post cracked me up lol. hahaha I'm thrilled anytime I can entert--TEACH kids.